Welcome to another chocolate alphabet week. Last year, I featured chocolates that contained names or items that started with A, B and C. This week, I'm covering D, E, F, G, H, I, J and K.
Today I'm celebrating the letter D with two chocolates. Yes, Dark chocolate is an easy choice for the letter D. However, dark chocolates and suppliers range from limited edition craft chocolate bars hand-made by small, bean-to-bar makers to high-volume confections churned out by large chocolatiers. 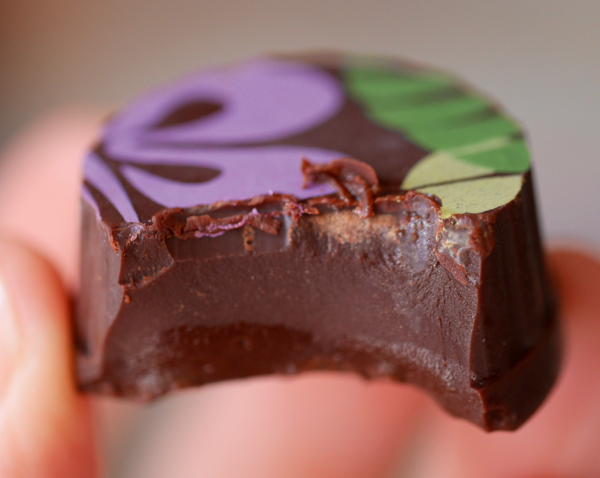 Dark chocolates are now available in every shape and cacao percentage one can imagine. 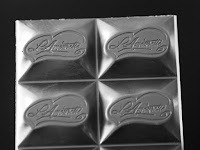 Chocolate in the U.S. is considered "dark" (semi-sweet or bittersweet) if it contains more than 35% cocoa solids. 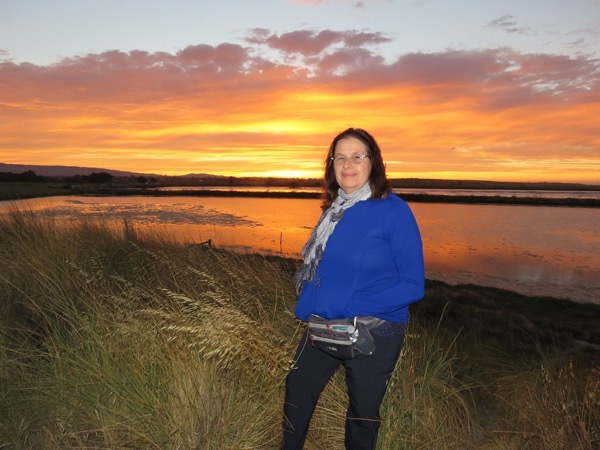 However, the percent you see listed on a label of a bar often refers to total cocoa content (cocoa solids and cocoa butter (fat)), so percentages don't tell the whole story. 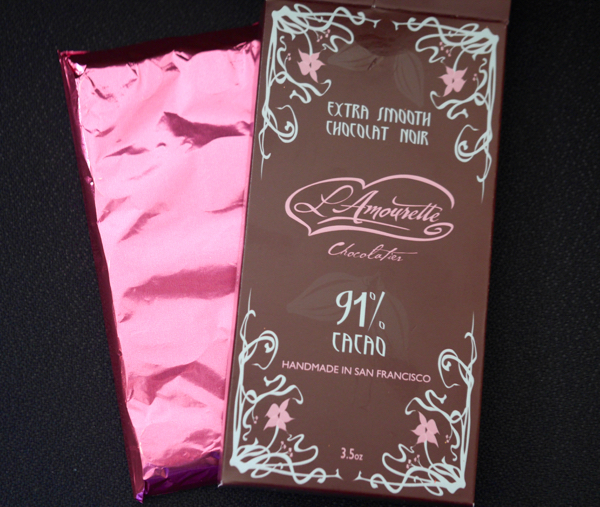 However, there was no mistaking that today's 91% Extra Smooth Chocolat Noir bar was a dark chocolate bar. This was the perfect chocolate for a noir film screening on a dark January day as it turned out; but it also brightened the day considerably—part of the paradox of dark chocolate. Handmade by L'Amourette Chocolat LLC (San Francisco, CA), this chocolate was made from Trinitario beans (Carenero Superior) that were "delicately roasted" and were conched (ground to make into a smooth, creamy chocolate) for up to 36 hours. 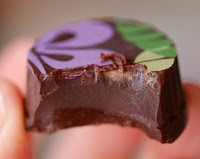 This complex and interesting 4-ingredient* bar had a dark forest aroma with notes of raspberry fruit and faint licorice spice, and a dark flavor with a range of deep fruit (fig) and spice notes with some very faint cacao funk in one small bite. There was very little cane sugar (a bit less than 9 percent) to distract one from enjoying this dark experience. Many thanks to Chocolate Banquet donors and supporters, including friends, family, clients (thank you GreenTown Los Altos! 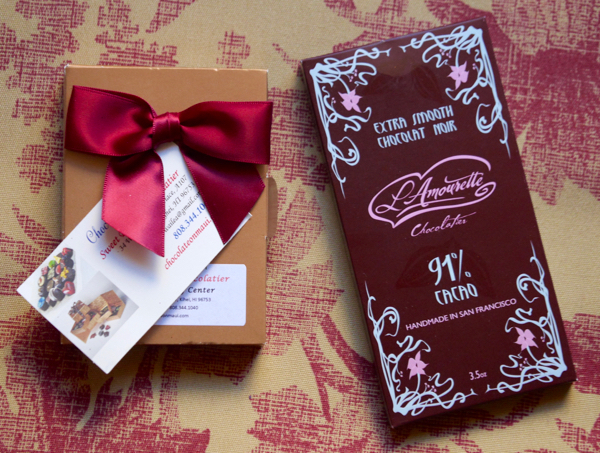 for today's 91% dark bar)—and others who bring back or share chocolates from around the world. 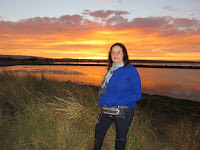 Special thanks to Toni Deser, a friend and neighbor who also loves good food and global travel. It's as delicious to hear about her adventures and travels as it is to try chocolates she finds on her trips. And she has been gracious enough to share many chocolates. Toni brought back today's Sweet Paradise Chocolatier (Hawaii) 6-piece variety box from a recent trip to (Maui) Hawaii—the only state in the U.S. where, at present, enough cacao trees are being grown to make chocolate in commercial quantities. This box contained 2 solid dark, 2 solid milk and 2 lovely flowing salt caramel chocolates. 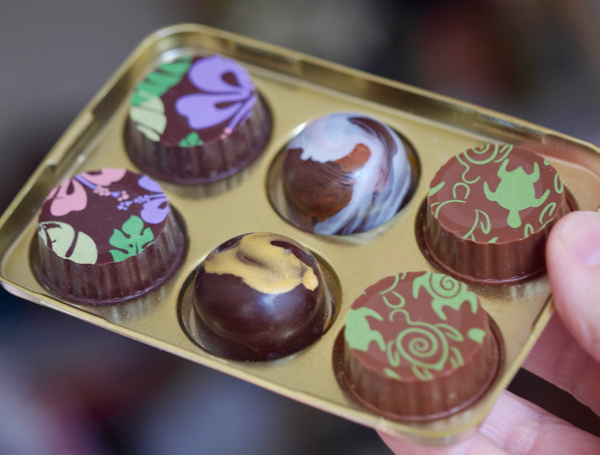 Sweet Paradise offers chocolates made from Hawaiian-grown cacao and was founded by Melanie Boudar. 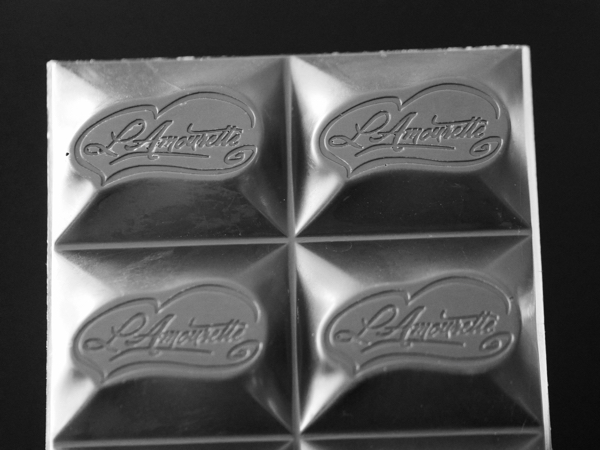 *The L'Amourette 91% Extra Smooth Dark Chocolate bar contained cocoa beans, cocoa butter, cane sugar and Bourbon vanilla beans. This chocolate was labeled as soy- and gluten-free.